Darien: Empire of Salt - Book One (2017. 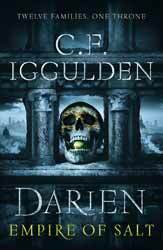 340 pages) is the new novel by C. F. Iggulden. First up I have to say just how much I enjoyed this book. Normally, regardless of their other charms, fantasy books nearly always seem to be an exercise in bloat narrative, parading endless journeys and inconsequential meetings which do little to advance the plot. But here Iggulden’s precision as a story teller is razor sharp, there is not an instance, not a conversation, which does not add to the complete novel. The society is one which is transitioning from swords, shields and mounted knights to gunmen and their six shooters and the juxtaposition is often used to explore characters feelings towards change, whether they berate the loss of sword skill or the change to a more impersonal form of killing. Darien is an odd place in that for the most part you think that this is just another constructed fantasy world. We discover that The Empire of Salt has not existed for thousands of years. What they have left behind are often powerful magical artefacts which can be used but can no longer be explained or copied. Just when you think you have this new world pegged Iggulden offers you a throw away sentence indicating that also in this place, but in the past, both Jesus and the Caesars existed. So, are we talking about an alternative history rather than a new world? Only time will tell. The book is told from multiple perspectives all of which culminate in the attack on Darien, each of the characters are either blest with abilities or powers which will change their lives. Elias is a hunter and an especially successful one as he has the ‘knack’ an ability to see a few moments into the future. This helps him trap, but others see different uses for his skill. Sally is a thief who has a power that even she is not aware of, but one which makes her possibly the most powerful character in the story. These two and other major players stories are wound around the assault on the city and never directly meet. Arthur’s story does weave its way through all the main characters as well as some of the secondary ones. A quiet child, looking no older than twelve, Arthur has his own extraordinary secret. The story contains no extraneous fat, polished, as it is to a bright white shine of enjoyment. The book works well as a standalone story as all the major threads are resolved at the end. There is certainly more to explore but at least the author did not feel the need to finish on an unnecessary cliff hanger. Overall, a well penned story, I shall look forward to the rest of the books in the series.